There is nothing quite like jamming to your favorite tunes, and for Marcus Glenn, capturing that feeling, rhythm and soul is his goal as an artist. Detroit is known for its rich heritage in music, earning it the nickname “Motown.” Everything from the blues and rock’n’roll to jazz and hip-hop has seen significant input from the city. Among its most noteworthy contributions to the music industry is its influence on R&B, soul, and jazz artists. 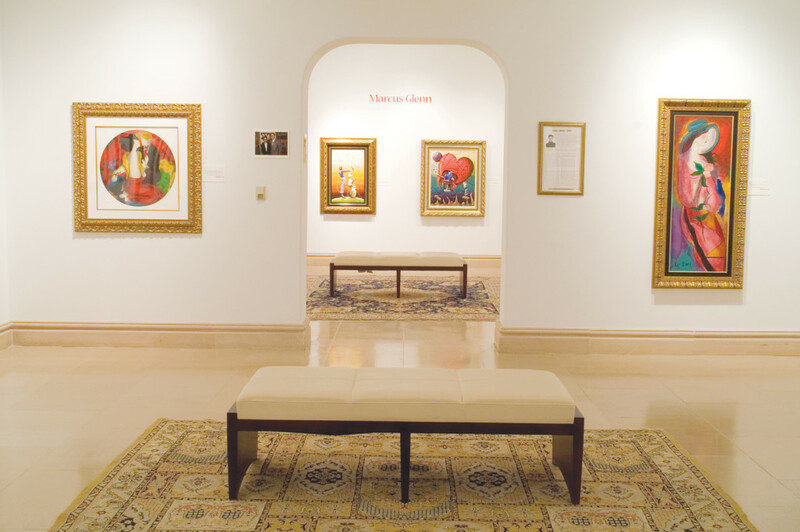 Glenn perfectly captures both history and music in beautiful works of art. His works are heavily infused with jazz, with many collectors commenting on how they can “hear” the music emanating from the artwork. 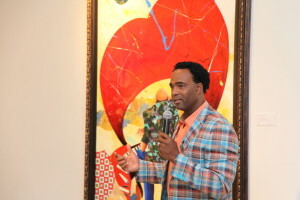 Marcus Glenn in front of “Piano Man Plays his Heart,” one of his largest works to date. 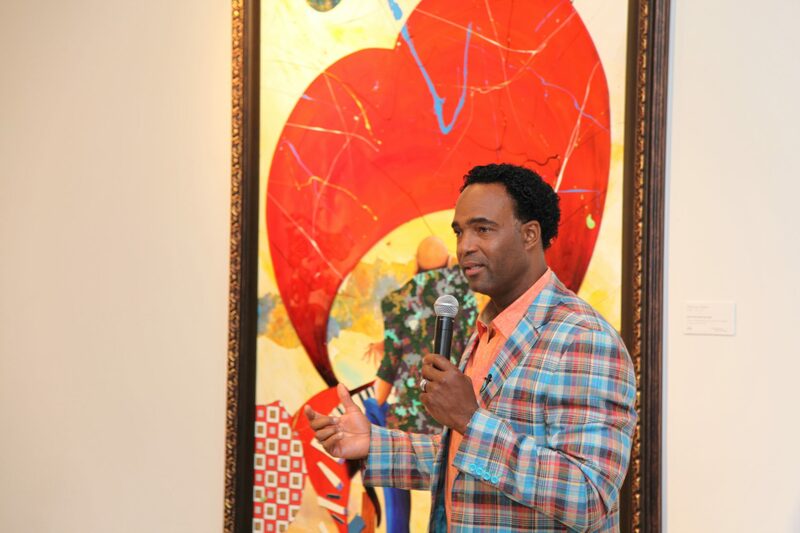 The Detroit native considers himself a “figurative abstract” artist, meaning he loves to include figures in his compositions. 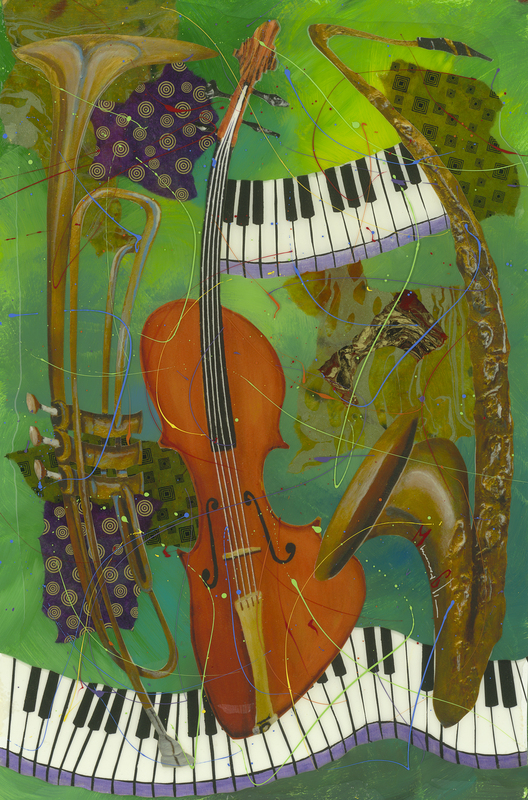 With his jazz theme, the instruments and jazz artists in his works take on expressive forms depending on what Glenn wishes to portray. For instance, he believes the instrument and musician become one when they play. “Visually I try to express that through the elongated styles and distorted shapes of the different instruments,” he says. One example of the instrument and musician blending is his “Piano Man” character. 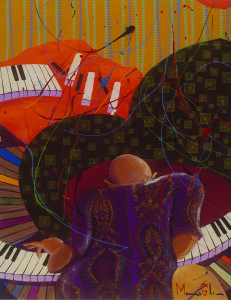 In his mixed-media artwork, such as the massive “Piano Man Plays his Heart,” the titular jazz artist plays a heart-shaped piano, but a hole in the instrument reveals the musician. The idea is to represent how a musician bares his soul when playing. “That is showing that he is playing his love, but he is exposing himself to his viewers,” he said. 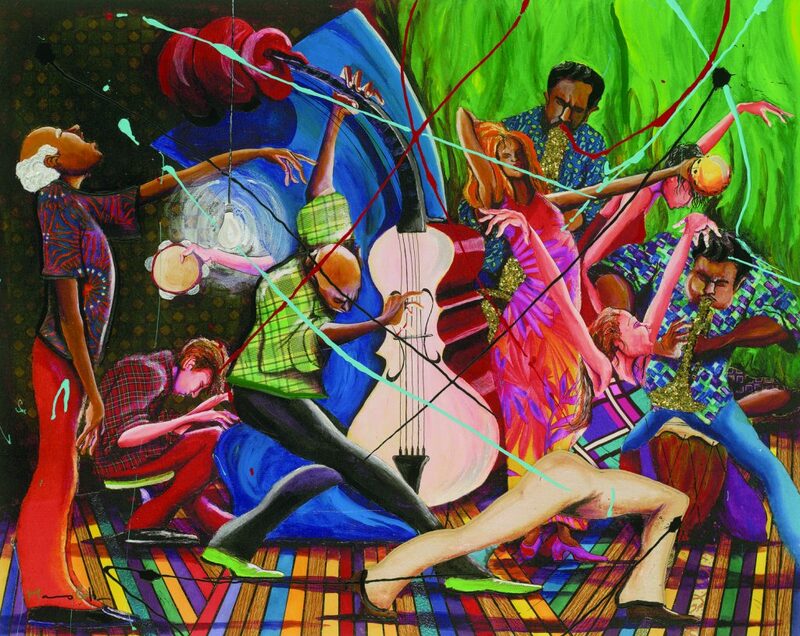 Another element seen in his artwork is the representation of music belonging to everyone. In his Grammy artwork, for example, Glenn shows piano keys breaking away, floating into the air and into the universe. “It no longer belongs to the musician, it belongs to the people who receive that music,” he says. 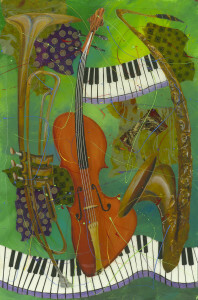 Contrary to what his paintings may portray, Glenn isn’t a musician, but is a lover of jazz music. Glenn’s father was an avid collector of jazz albums. He recalls listening to his father’s music growing up and came to appreciate it as he grew older. Between this and his mother’s encouragement to pursue his passion for art, Glenn found his true calling. 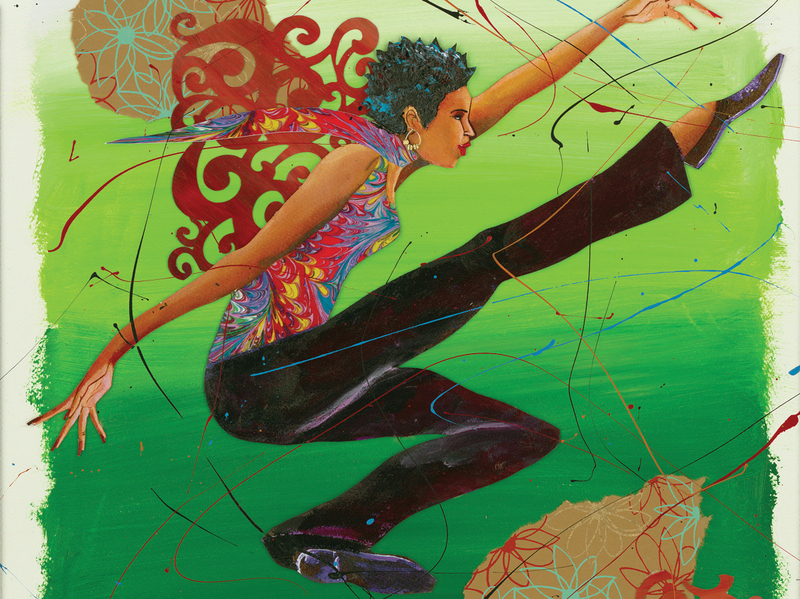 Glenn says jazz became one of his favorite themes to portray in his “Flat Life” art. 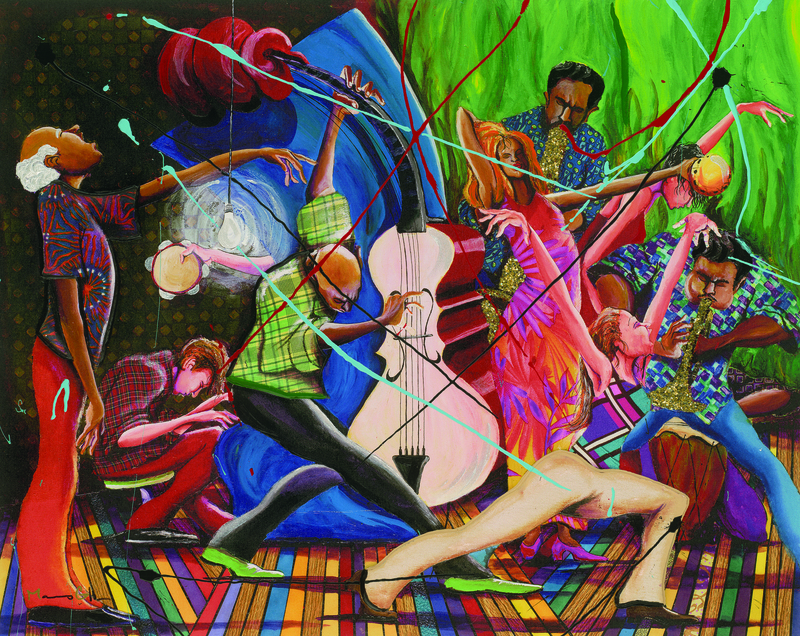 Like the musical style, Glenn is expressive and creative when depicting scenes of jazz artists. Splashes of color similar to Jackson Pollock’s “action painting” show the energy and sound of the musicians. Glenn will often put on jazz music when working. So what jazz artists inspire Glenn?